If you're reading this, chances are you have a lifted or leveled Ford F250 or F350 Super Duty with some steering issues or tracking issues. This issue is quite common on lifted Super Duty trucks. This isn't only annoying, it is unsafe. With that said, Ready Lift has your solution. 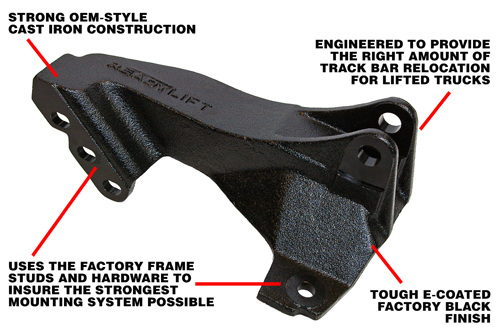 The ReadyLift Track Bar Relocation Bracket for SuperDuty Trucks is made of OEM style cast iron, meaning it is built to withstand anything you put it through. It has a lifetime guarantee to never chip, break or fail. Don't be fooled into buying a cheaper welded plate bracket.. They break time and time again, which creates a very dangerous situation while driving! 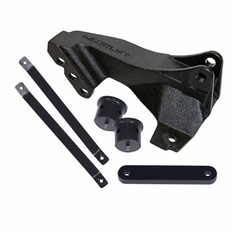 This Track Bar Relocation Kit also includes bump stop extension brackets and fender braces at no extra charge to make sure you've got the equipment to bring back your ride quality. The part number for this item is 67-2538 and it fits 2008-2016 Ford F250 F350 Super Duty models.